Jason finally got to Singapore while I was visiting Darwin on day 2, so on day 3 Darwin got a special surprise. Dad! When Darwin first got to quarantine our pet mover had mentioned that while Darwin's crate was very big, it was a little narrow and Darwin's legs seemed stiff from not being able to stretch out while she was in it. 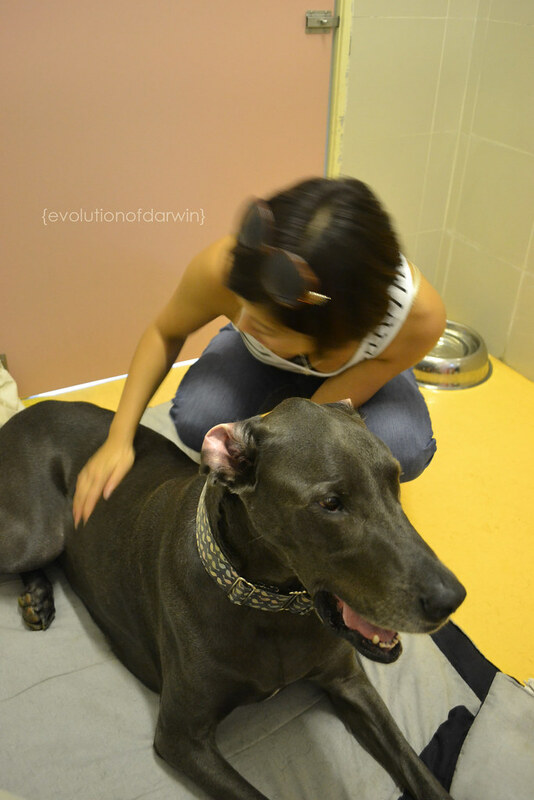 So while we visited Darwin we made sure to give her good back massages. Now that I knew the drill of quarantine (get there at 4, sign in, get Darwin out for her 15 minutes of outdoor time, sit in the room for the next hour and half) the second day I came with a treat to entertain her. On the second day I think Darwin had figured out the drill as well. Unlike day 1, she was standing and waiting and I could hear her barking as I walked into the hallway. 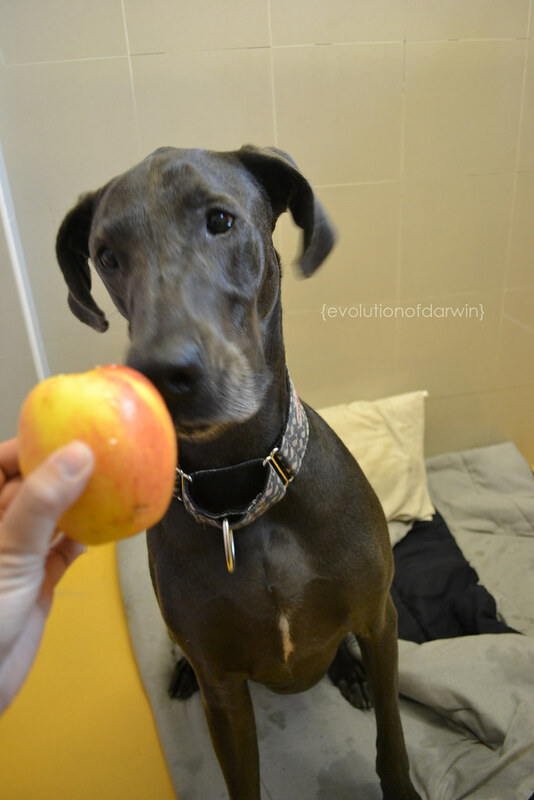 I had noticed the lady across from us had brought string cheese for her dog, so I thought I'd bring Darwin apples! She loved it! She was more vocal when I left on day 2 than on day 1. I've got lots to update leading up the move, but since I'm already behind, let's just start with the our first days in Singapore. I landed in Singapore on Monday June 25. I was the first of our family to leave Seattle (2am flight Sunday the 24th). 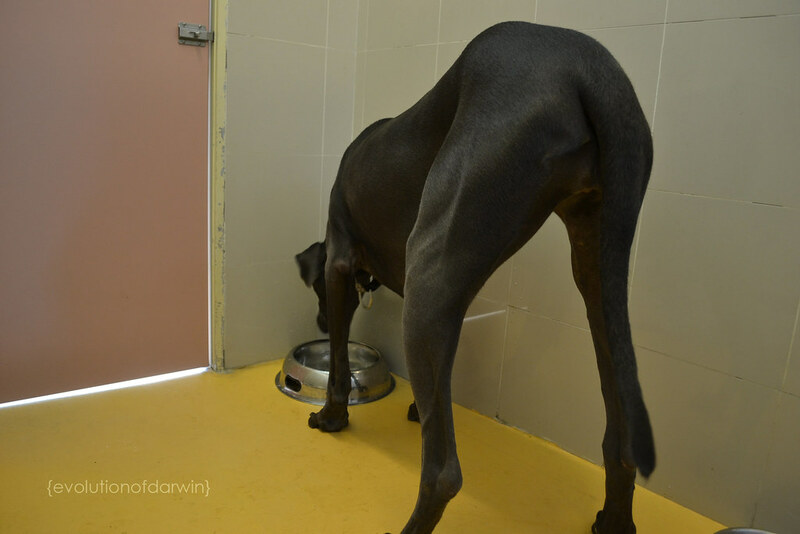 Darwin landed in Singapore Tuesday June 26 and went straight to quarantine. 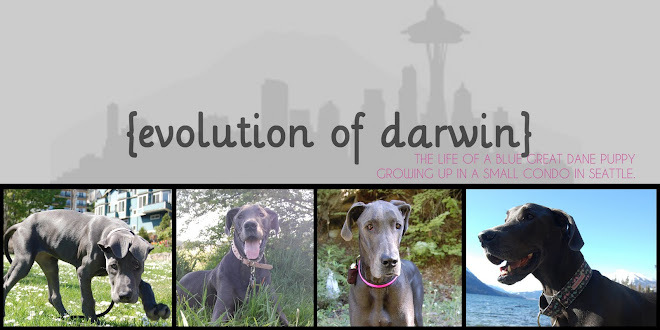 Darwin was the last to leave Seattle (7pm flight Sunday the 24th). Jason landed in Singapore on Thursday June 28. He left Seattle 12 hours after I did (2pm Sunday the 24th). 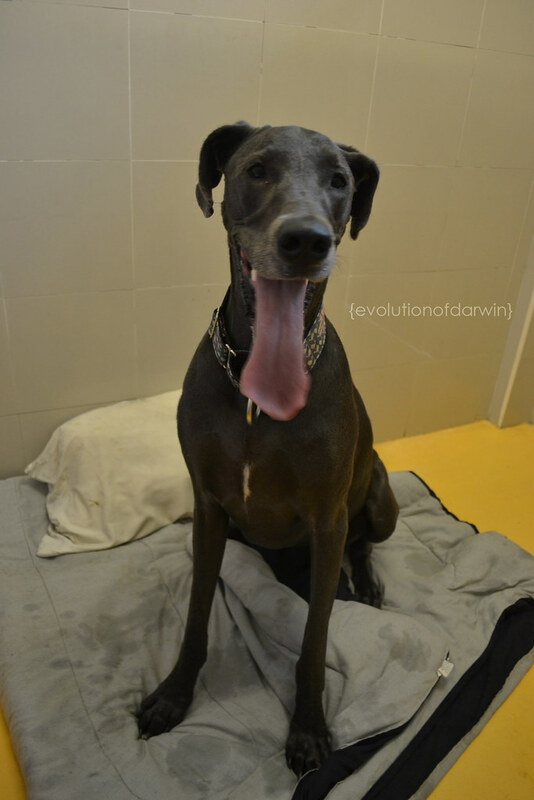 How did Darwin get to the airport you may be wondering. Well, Jason dropped Darwin off at her brother's house around 10am, and from what I've heard, for the first time ever she resisted staying there. 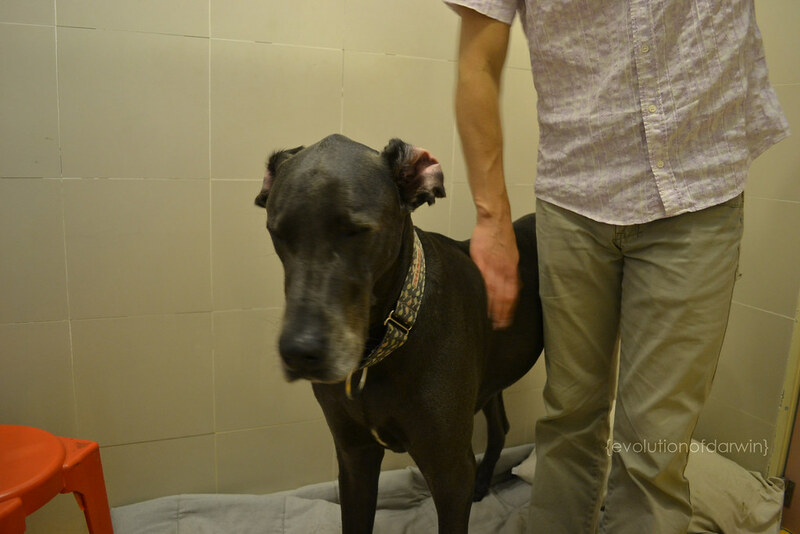 She actually slipped her martingale collar backing up, but didn't go anywhere. Jason managed to collar her again and he and Kristie got her in the house (or back yard). I think she finally realized something was up. 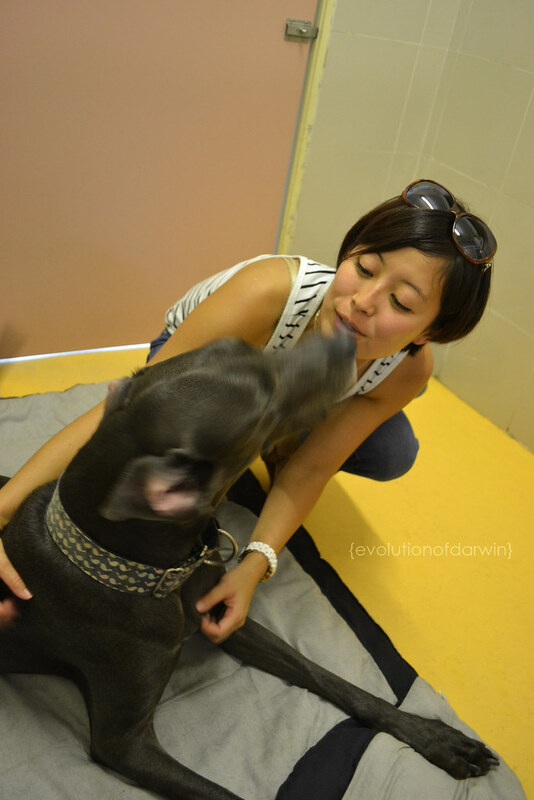 Kristie was so nice to take Darwin and get her to the airport for us at 4 to get checked in and meet the pet mover with her crate (sorry in all the goings on no one actually got a picture of Darwin in her giant crate). 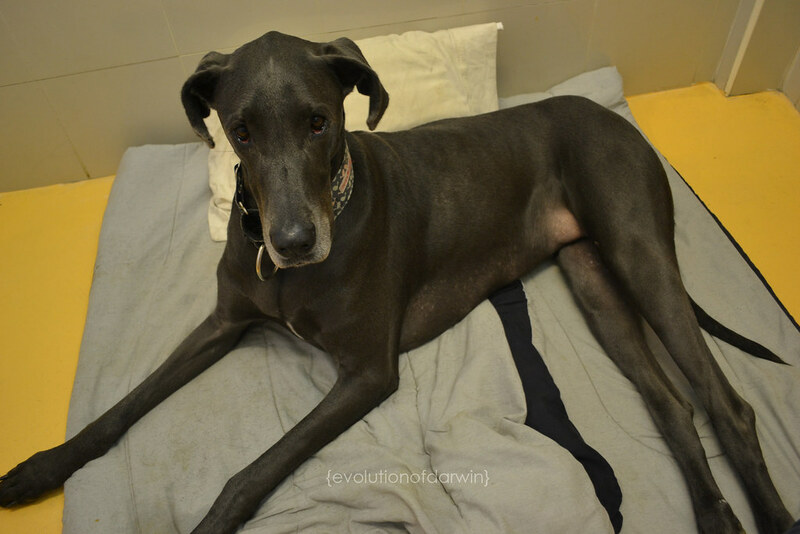 Darwin took a British Air flight from Seattle to London then had an 8 hour layover in London where the BA people moved her to their kennels and she got to eat a little and stretch her legs. 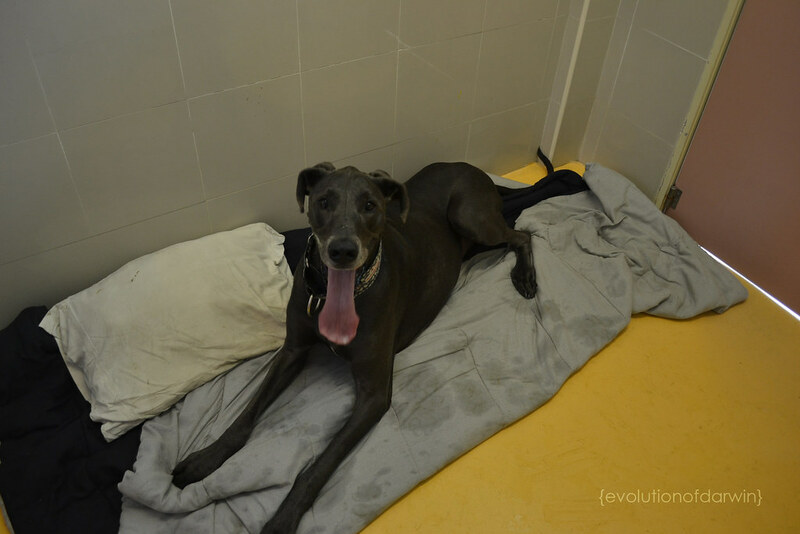 BA then loaded her back in her kennel and took her back to the airport for her last flight from London to Singapore. 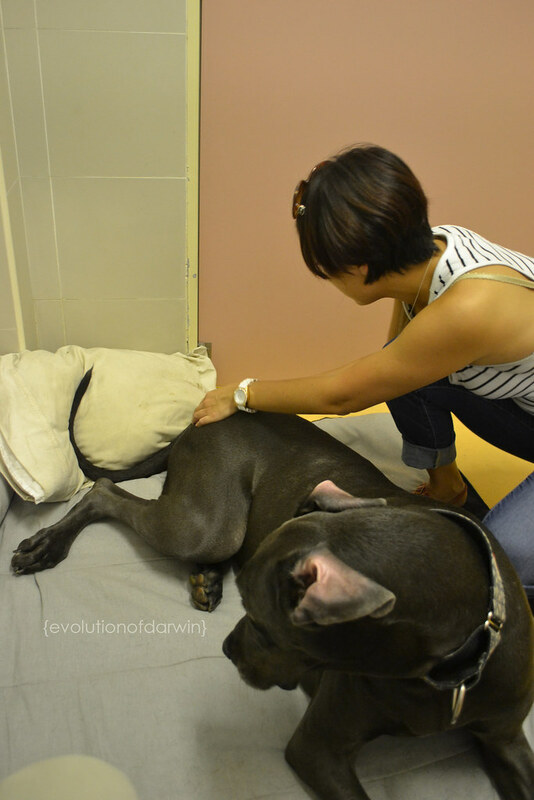 Our pet mover in Singapore (Pet Embassy*) met Darwin at the airport and transported her to the quarantine station and got her all settled in. They emailed me after they dropped her off to update me on everything. She got to quarantine on Tuesday, but their visiting hours are only from 4-6pm so I couldn't visit her that day. Wednesday at 330 I left work, hopped in a cab and made my way up north to the quarantine. When I first showed up at her room she was laying around and just looked up at me through the window. It took a few seconds for her to get up and start barking. 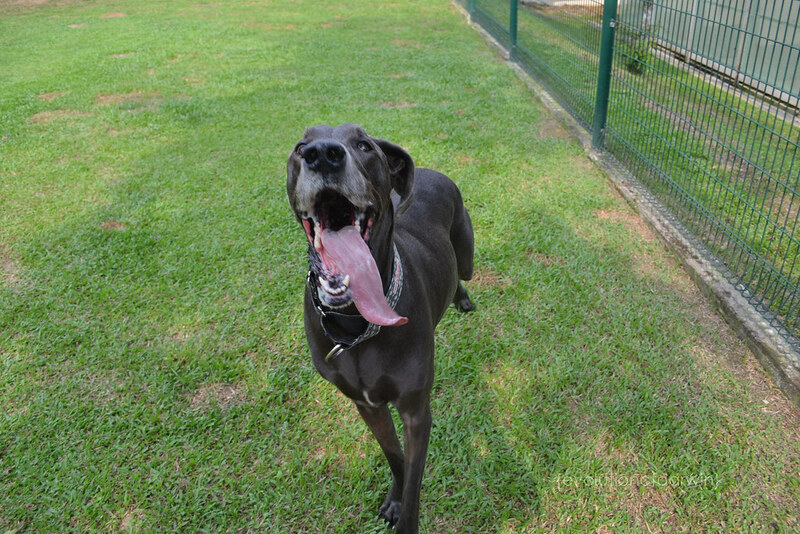 At quarantine you can take your dog out for 15 minutes in one of their enclosed runs. Since I got there right at 4 we were able to quickly get out into a run and Darwin could stretch her legs. 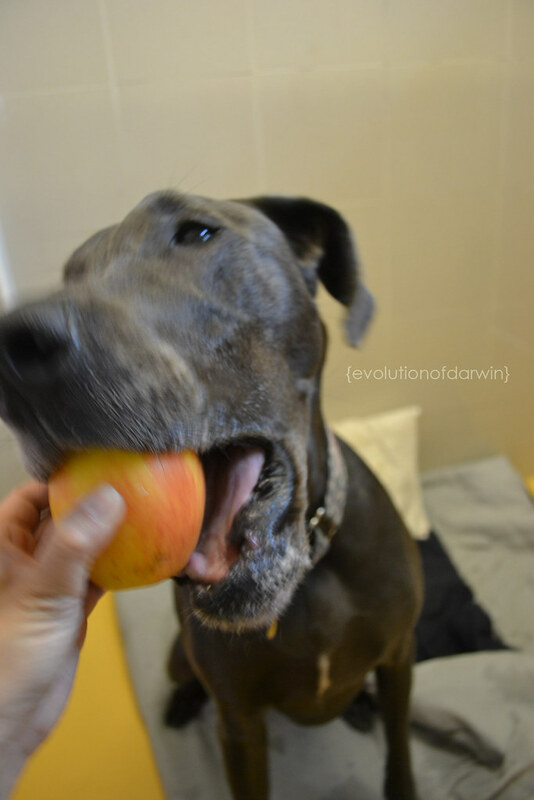 Darwin was never a overly slobbery Dane, but since we've been here, MAN the slobber! So gross! When it was time to leave I made sure to just be very calm about it and say a quick see you later and walk out. 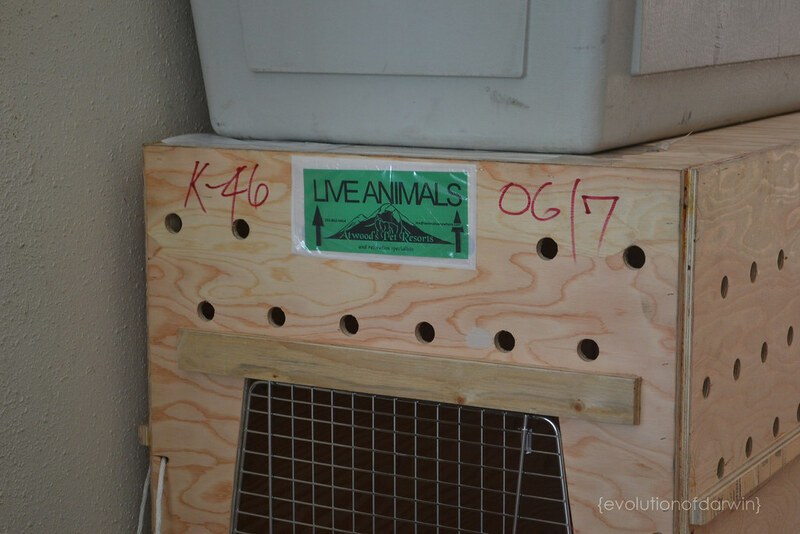 As I walked out I got a peak at Darwin's crate. While I was there I met a lady who's dog was there for 30 days! I can't imagine. As I posted pictures to instagram, another lady commented on a picture saying her little dog is there for 119 days! 119 days! 4 months! Out of control! I don't think I'd be able to do that to Darwin if that was the requirement. 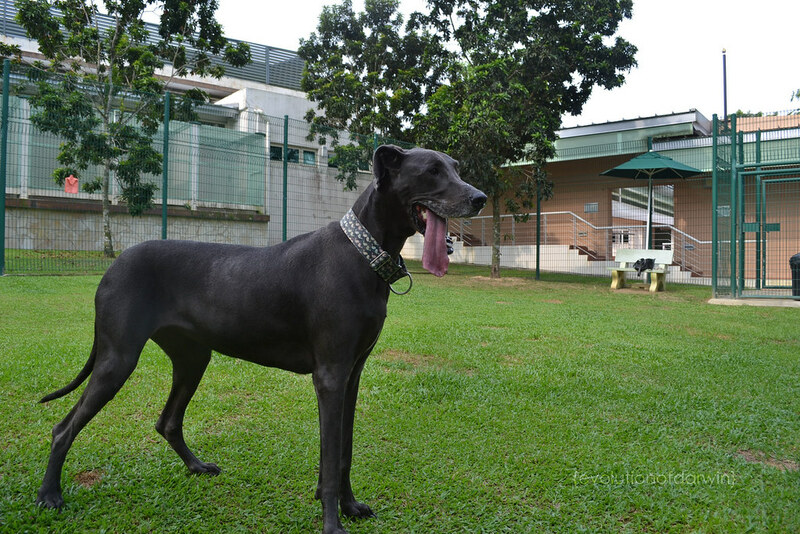 *If you are ever moving to Singapore (and maybe even out of) and need a pet mover (I highly recommend using a pet mover) I would definitely recommend Pet Embassy. They were super easy to work with, super helpful and were in constant contact if I had any questions. Moving is so stressful, hence no posts for.... however long it's been, but we have all made it to Singapore and hopefully that means we'll start blogging regularly! 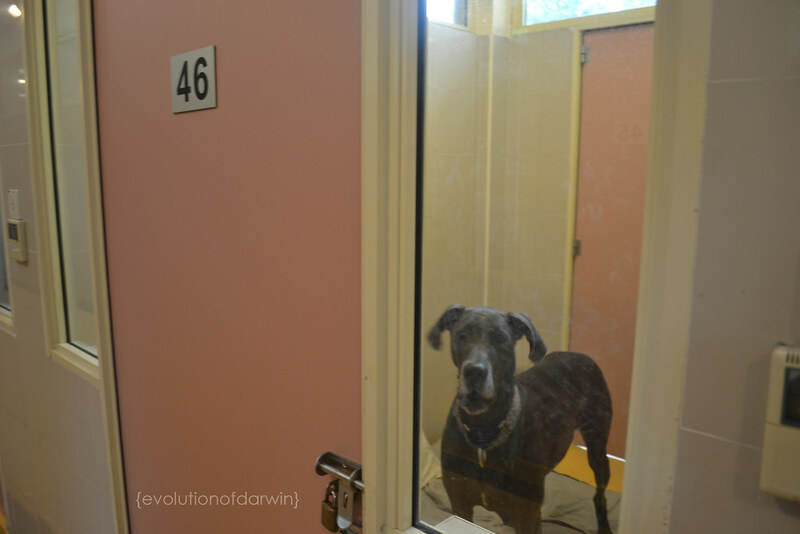 Darwin's on day 8 of quarantine (out of 10) and will be released on Friday! Woo hoo! BTW, happy 4th of July!